Make your way to La Boquilla, located just a half-hour from downtown Cartagena and easily accessible by bus or taxi. 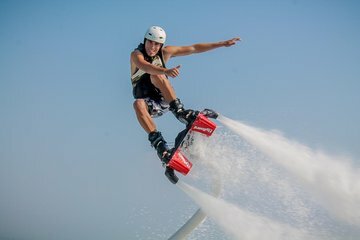 The Flyboard Center is located at Vista Marina Casa Hotel 782, Cra. 9 #4622, La Boquilla, Cartagena, Bolívar, and is open daily between 9am and 6pm. Once you arrive for your flyboard experience, you'll meet your instructor and get a 10-minute lesson. This short lesson is sufficient for most participants to get the hang of hovering over the Caribbean Sea's surface, doing tricks and dips in and out of the water. Spend 30 minutes flying with views of La Boquilla before returning to the Flyboard Center. Fly boarding was amazing!!!!!!!! my boys loved it, they said it was fun. The ocean water was warm and the guys that took them out were amazing and very patient, they were very knowledgeable.. We would do it again.